TechRadar was recently invited over to Redmond by Microsoft as part of the new Windows Phone 7 launch, and we were treated to a behind-the-scenes look at how the operating system is developed. The Microsoft Redmond campus is vast - 50,000-odd Microsoft employees are housed there, and it even has its own sports pitches and shopping malls, making it feel like the equivalent of a massively corporate Center Parcs. But it's Windows Phone 7, Microsoft's new mobile phone operating system that we were the most interested in, and we were treated to some insights into the work going into it. The first thing you realise is that the amount of effort going into the project is huge. Hundreds of Microsoft employees on the campus are tasked with making Windows Phone 7 the best it can be, and a huge amount of equipment is used. The first area is the server farms, where thousands of virtual phones are running night and day. Where previously rows and rows of dedicated PCs were virtually running the operating software to check for faults, the new servers can run the software through every conceivable situation and report back when crashes occur. Darren Laybourn, VP, .NET Business Framework at Microsoft Corporation, explained to us that this meant that Windows Phone 7 was the most tested OS the company had ever put out as it was keen to make a real success of the platform. Should a device come up with a critical error, it will take a snapshot of what it's been doing before the black screen and feed it back automatically to the engineers who can investigate the problem - something Laybourn says has helped uncover a few potential problems. Wandering further into the heart of the development centre, it's not all virtual ideas though. Phsyical hardware is littered around the place, with partners' hardware (such as Toshiba and Acer) that haven't been officially confirmed as Windows Phone 7 device manufacturers plastered all over the place. These phones are used for a variety of testing purposes - but the scariest ones are the drawers and drawers of autonomously working phones, randomly voice searching and entering text to see if anything will make the Windows Phone 7 handset fall apart and crash. But the software is part of a virtual world - the mobile phone has a number of real things to go wrong as well, such as touchscreens, accelerometers and cameras. 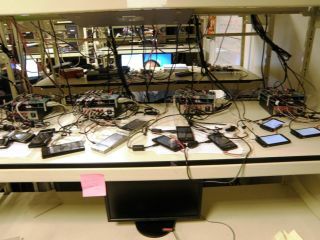 To that end, Microsoft has a number of machines to test the stability of Windows Phone 7 in these conditions as well. A rather dangerous-looking stamping robot will carefully scan a display and then press on random areas to see if it responds correctly, and a more exciting machine will fling a phone in all directions and monitor the responses of the sensors. The same room at the Microsoft Campus is also dedicated to continued upkeep on older versions of Windows Mobile - although as you can see from the picture below it seems Microsoft is keen to make a point about how archaic it sees it by virtually running it on one of the oldest monitors in the world. Of course there's another side to the testing - actual people prodding the phones like normal users would and seeing what happens. These people sit surrounded by the handsets and carefully press, click and stroke all the areas to see what's actually going on with Windows Phone 7, noting down when errors or poor experiences crop up in an area that looks like The Office decorated by Johnny Five from Short Circuit - wires, PCs and phones fill every shelf. That's not actually completely true; there are also other interesting things like a cupboard so full of snacks that we couldn't even believe it and a massive whiteboard with the heading: "Ways to be better than the iPhone." (Actually, it had something about error protocols, but we'd like to imagine that's just code). There are also some less well-known phones sitting around - for instance, another LG Windows Phone 7 handset (the GW910) was boxed all over the place, and that's a chassis two device (as in it comes with a physical keyboard) so we know that won't be available in the shops for a while. It seems Microsoft it making more of a comprehensive push with Windows Phone 7 than ever before, although we'll wait for a more in-depth play with the platform before we even begin to scrub the nightmare of early Windows Mobile phones from our memory banks.